(L-R) Nick Ross – Celebrity Broadcaster and crime prevention campaigner, Georgie Barnard – Met Police Crime Business Unit, Michael Foster – CIS Security Officer, Nick Hawksley – Regional Account Director CIS Security, Neill Catton – Managing Director CIS Security. CIS Security, the independent security specialists, have won the OSPAs in the categories Outstanding Customer Service Initiative and Outstanding Security Officer. 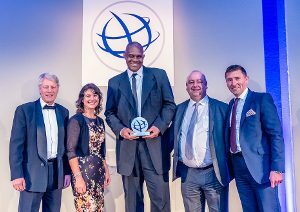 The first-ever UK Outstanding Security Performance Awards (OSPAs) took place at the London Marriott Hotel Grosvenor Square in London on 2nd March. Over 330 security professionals gathered to celebrate the best of the best from across the sector with dinner and a presentation hosted by celebrity broadcaster and crime prevention campaigner Nick Ross. CIS Security’s Officer Based at University Hospital Lewisham, Michael Foster, was praised by a hospital visitor in the Metro Newspaper’s “Good Deed Feed”. Michael recognised the value of the story in providing a positive example and also in helping to promote the broader industry communication objective of evidencing security professionals as a “Force for Good”. Michael’s willingness to get involved in a number of serious incidents at the Hospital applying his knowledge, skills and empathy has had potentially life-changing outcomes for patients and their loved ones. His sensitivity and kindness toward patients who are very often confused or vulnerable in other ways, is a superb example of the specialist approach a security professional should take in a public healthcare environment. CIS have expressed delight at Michael being recognised as a positive role model in the industry. He has been hailed as is an enabler when it comes to the elevation of the security guarding profession in the eyes of the customers and also the general public. CIS also took home the award for Outstanding Customer Service Initiative of the year for their customer experience programme, “Safe, Happy, Informed and Listened to”, which was also a runner up at the 2016 British Institute of Facilities Management (BIFM) Awards. CIS were the only Security specialists to feature at the BIFM Awards.